Is it because the BBC’s drama Casualty ran a storyline about malnutrition caused by benefit sanctions last night (Saturday)? Whatever the reason, today’s Observer carries a welcome story highlighting the fact that people have been pushed to suicide as a result of benefits sanctions “in austerity Britain”. The article states that the Department for Work and Pensions is investigating 60 claimant suicides with possible connections to benefit sanctions. It continues: “This week the [Commons] work and pensions select committee will hold its first oral evidence session for its inquiry into benefits sanctions policy following last year’s limited Oakley review. This is a welcome admission by the mainstream media that there is a serious problem with the Conservative-led Coalition Government’s benefits policy. At a time when the Tories are planning to cut back spending on benefits even further, let us hope members of the reading public can draw their own conclusions about the “compassionate Conservatism” that David Cameron was trying to push on The Andrew Marr Show this morning. ending malicious falsehoods about hated political policies. Radio 4 gets very high ratings, especially among people who vote. You’re probably thinking of Radio 1. That’s something for Whippersnapper to sort out. It’s a DWP list; what do you expect? Slightly off topic Mike, but have you noticed that everything has gone silent where Universal credit is concerned? I think it’s just that other matters have grabbed more attention. UC is still bubbling under – Iain Duncan Smith wants to accelerate implementation so Labour can’t reverse it in May, for example. Some hope. It doesn’t work. I’m having a premonition…. the select committee will present their evidence; then, one of two things will happen. Either a) the committee will find no link between benefit sanctions and suicide, and the matter will be forgotten, or b) the committee WILL find a link in some cases, IDS will stamp his little feet and ignore the findings, and the matter will be forgotten. This is an election year, after all – we can’t have any stories that paint our glorious Conservative overlords in all by kind of negative light, can we? It’s a bit late for that – and it’s only January 4! 2.2 MILLION innocent British deaths so far, CAUSED DIRECTLY because of sanctions, has already more than ‘tainted’ the Conservatives for all time. This government from IDS to Cameron to May know what they have done and if they don’t why are they running our country ? Shame! Shame! Shame! We knew about this and so DO the DWP. All MP’s who ignored, and in one case implemented, these sanctions should be brought before the EEC Courts and properly punished. I’d prefer the European Court of Human Rights, which is a Council of Europe organisation. This come as no surprise that the limited numbers selected for enquiry, 60, is just a sop to try and silence campaigners who have been screaming about the injustice of the Work Capability Assessments link to deaths not just sanctions. What I find amazing is that the mainstream Observer and its sister Guardian who have done a lot to expose miscreants in the hacking scandal, Have only just discovered this crime against humanity. In the paper reviews on BBC Breakfast and later on the Andrew Marr show there was no mention of the issue and Marr had the main architect sat in front of him and failed to mention it. Andrew Neil had IDS the other week and no mention of it. Could it be that the BBC no longer employ principled investigative journalists and researchers or is the truth do not mention the elephant in the room. With everybody pretending they are covering the main issues while the truth is the long reach of impending exposure with regards to the Saville cover up and who was involved being held over the heads of decision makers at the BEEB so that the propaganda machine can be controlled. This is just an idea that could have foundation in truth and would explain why no one is telling us what we should know about this eugenics strategy. Make sure you let your preferred candidate know what you expect from them in return for your vote! That would be a good move for us all at the hustings. I am meeting my local mp next month he says he is going to find out about my concerns with my problems we will see . Many people are sanctioned and never understand why. Which defeats the point as far as punishment goes since if you are punished but don’t understand why the punishment won’t stop you from repeating the mistake in future. Surely there should be some kind of warnings given before sanctioning a claimant so that he/she can at least make some attempt to satisfy conditions imposed on him/her? It seems that these days people are considered guilty until proven innocent. One point for all those appalled by this government. Please do not write sarcastic points or what can be viewed as hysterical overreactions. 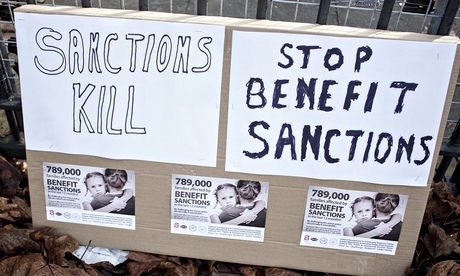 This government must be brought to task for their actions, which it seems were done to target those on benefits who have developed benefits as a way of life…..however, in reality the sanctions have hit hardest the vulnerable in society……………but the government refuses to accept this! The problem is “benefits as a way of life” has no foundation in fact whatsoever. My apologies, I should have put “benefits as a way of life” in quotation marks….it is the right wing justification for why they are doing this….they are not my words or my view…..but it does illustrate why clarity of language is important.